Often, you may be presented with problems - whether they are personal, academic, etc. You'll need to devise a method to cope with that problem, and in doing so, you are defining your potential as a genius. A genius need not be an intellect. It could be a nobel peace prize winner. To be a genius, you have to ward off the battles that you envision, and you must do so effectively, efficiently, and with high devotion. How do you do that? Look at life from a different perspective. Think outside the box. Here is a concrete example. In 1780, a German schoolmaster devised a problem to occupy his students for what he thought would take lots of time. Of course at this time, calculators and computers were unknown. The schoolmaster asked his students to calculate the sum of all numbers from 1 to 100. Many students started right away. 1 + 2 = 3 then 3 + 3 = 6 then 6 + 4 = 10 then 10 + 5 = 15. And so on. Of course, this did take lots of time. But one student decided to look at the problem from a different perspective. Karl Friedrich Gauss thought of the problem as many sub-problems. He considered the pairs as follows: 1 + 100, 2 + 99, 3 + 98, 4 + 97, etc. and created all 50 pairs, ending with 50 + 51. He noticed all the pairs summed to 101. He simply computed 50 x 101 and arrived at the correct answer: 1 + 2 + 3 + ... + 100 = 5050. For this effort, he is still considered a genius. He used a different perspective. Try it out. 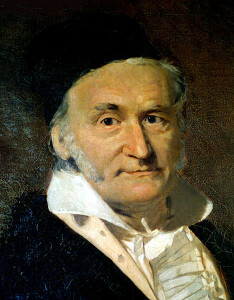 Carl Gauss - Famous mathematician from Germany in the 18th and 19th centuries.